SCC Staff and Students Welcome International Students with Open Arms! Today was about welcoming and celebrating our international students in taking a big leap forward and stepping out of their comfort zone to meet new friends and build on their English speaking skills. Every Tuesday and Thursday during lunch, the English Café run by Mrs. Blackwell and Mrs. Sanowar is open not only for international and ELL Learners, but for our domestic students to have the opportunity to introduce themselves and make new friends. Some of our 9 and 10 English students extended their warm wishes in writing the international students a personal message to welcome them to our SCC community and describe what it means to be a true “Cardinal”. Mckenna Annett, a grade 9 student writes, “Hi! Welcome to St. Charles. We hope you have a good high school experience here. Remember once a card, always a card! We hope you enjoy sports teams and clubs to meet new people”. 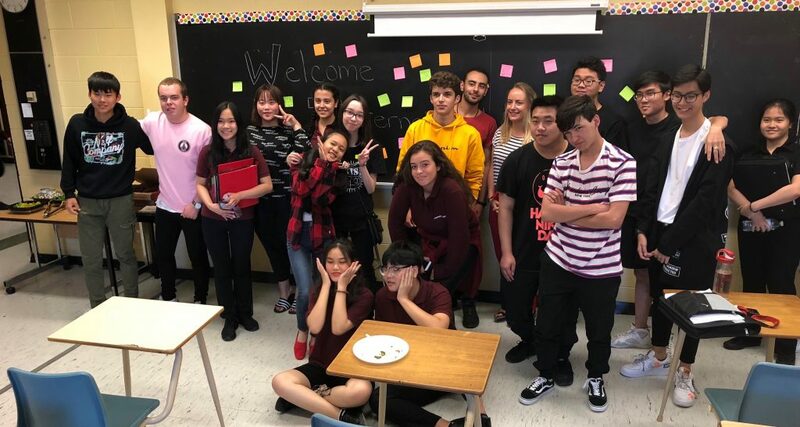 The English Café is a social club that runs interactive cultural activities, games, and dance offs and plans upcoming educational trips to Toronto, Niagara Falls and Killarney throughout the year. This is an interactive space for students to feel comfortable, supported and accepted in sharing their cultural differences. Our international students can give international experience to our own SCC students, expand our worldview, and learn the value of linguistic and cultural diversity. Our current student population demographics are changing and we are proud – this is significant and life changing for all, as we become a much more welcoming and inclusive society.